They say Nashville’s fireworks show is the 3rd best in the nation, after New York City and Washington, D.C.! UPDATE: This is the year that everyone’s saying Nashville’s fireworks is the largest in the nation. Up til now, Nashville’s fireworks show has ranked #2 behind New York City’s fireworks show. We’ve lived here 5 years and have never watched Nashville’s famous fireworks display — until this year. 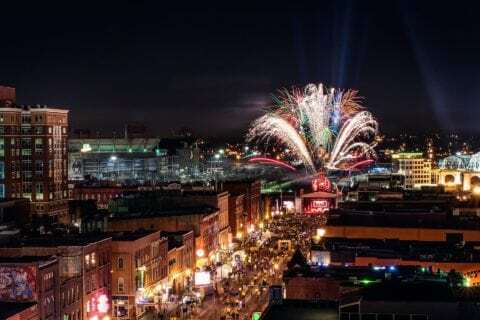 But this year, we decided to venture toward downtown Nashville to watch the Fourth of July fireworks display downtown for the first time. Our #1 tip for watching Nashville’s fireworks from downtown: Consider arriving late! Luck might just be on your side if you arrive downtown 20-30 minutes before the start of the fireworks — if what we witnessed is any indication. We actually arrived 45 minutes prior to the start of the fireworks, and we paid $10 to get a spot in a downtown parking lot (…the one directly behind Bridgestone Arena). However, about 10 minutes after we arrived, we noticed the parking lot attendants started counting all their money and packing up their gear. They all pulled out about 20 minutes prior to the fireworks. (My guess is they all scampered to their families who had reserved spots for them to watch the fireworks up close.) As a result, anyone who tried to find a parking spot in these lots from this point on got in FREE… and there were still a few dozen spots available. Here’s a list of the best places to watch Nashville’s fireworks. We watched the fireworks from the parking lot directly behind the Bridgestone Arena. 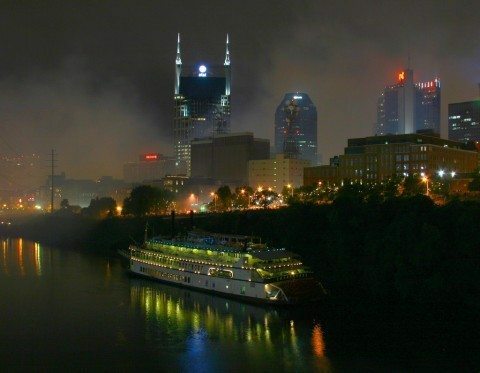 We had the Nashville icon — the AT&T building (a.k.a. “the Batman building”) in every photograph we shot. I found this to be a cool effect… clear documentation of where we were on this particular Fourth of July. We had a big ‘ol tree to shade us from the sun. The AT&T building was in all of our photos. As cool as this is… for a few pictures, I would’ve preferred to capture some without the mammoth skyscraper. Cars were constantly driving past us on their way in and out of the parking lot, hoping to find a last-minute parking spot. Since the fireworks were lower than we had anticipated (due to the fact that the riverfront area is fairly low in a valley, while the Bridgestone Arena is higher up on a hill), the Bridgestone Arena itself, and other nearby buildings blocked our view from anything that happened closer to the ground. I think we missed a good deal of the “spectacular” part of Nashville’s light show because of this. We might try parking somewhere along 8th Avenue (Franklin Road, before the Greyhound bus station) next year. Lots of people were parked there, and we noticed that it would be possible to see the lower lights and colors much better from that location. Of course, the ideal spot — if you get there early enough to secure a spot — would be somewhere along the pedestrian bridge over the water! City Guide ranked Nashville’s fireworks show in the top 11, calling it a “most musical boom” in the country. In fact, it’s the only show in the country that is tied to LIVE music. More great info about Nashville’s fireworks. 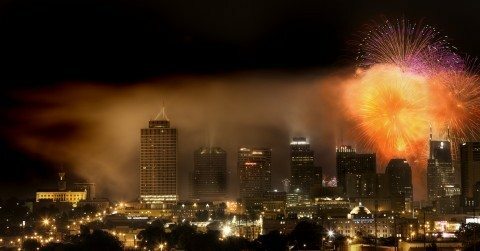 The Adventure Science Center sells a limited number of tickets for “the best seat in the house” from which to view Nashville’s fireworks and enjoy the ASC’s own 4th of July events. They sell out each year, so reserve yours early! Here’s an updated list of Nashville July 4th activities including Nashville 4th of July concerts and how to view the livestream of the Nashville fireworks show.